(AINA) -- She opened the door quietly and looked at us. Her eyes caught Linda Asmar, the only woman among the crowd and stepped in the room cautiously. Adult men suddenly began to raise their voices, shouting and interrupting eachother. The girl's face flushed red for a moment and leaned against the wall. When the men became calmer, she approached Linda and smiled at me. Her almond shaped blue eyes were so sweet. I was about to ask her name when the crowd got mad once again. We were sitting on the floor in a big room of a village house. The village, "Yayvantepe" was located in the southeast region of Turkey. It was luckily a sunny day. Otherwise we would surely be cold. The heater was off, for the headman of the village did not allow the electricity to be turned on, saying it was costly. The battery in my computer was almost dead and I persuaded them to turn the electricity on. As Linda told me later, the women had finally found an opportunity to use the oven once again. The headman of the village and his fellow men were introduced as very radical Islamic fundamentalists by the press. I was intending to find out how bigoted they really were. Many newspapers wrote that the villagers had been threatening to spoil one of the most sacred places of Christianity. I asked them what it was all about. "They are lying. It is the metropolitan and his associates who spread these unfounded allegations. It is them who invade our lands and they should face these allegations, not us! 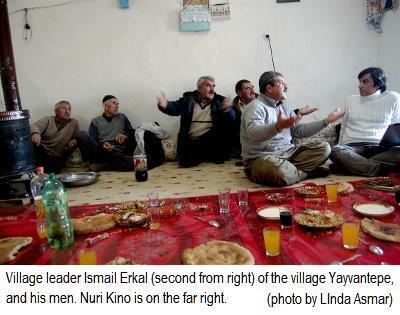 ", Ismail Çaglayan, one of the oldest shepherds of the village shouted. "Shut up! You should talk more politely", Ismail Erkal, the headman shouted back lifting up his hand. The blue eyed girl, Büsra, took Linda's hand gently and lead her out of the room. They should have been seated in another room with the other women. But men kept on yelling at eachother for a couple of hours more. The date was 20th of December, the day after the trial which had caused 3 Swedish congressmen and one EU official representative come to the southeast part of Turkey as observers. The issue which would be handled during the trial was uncertain until the last minute. Being a reporter and a kind of "expert in the issue", I attended the delegation beginning from the early hours of December 18th. In my childhood I lived in this region and later visited there in several occaions. Meanwhile, because of my direct relations with some relevant people including the metropolitan, I had the opportunity to investigate the fate of the Monastry closely. The delegation which was composed of Swedish politicians and some representatives of the Assryian organizations, made meetings with the governor, chief official and the attorney of the Monastry region. They were trying to figure out how and why Turkish government would allow some radical Islamic people threaten to destroy the Monastry with its nearly 30 poor children ve 70 unprotected residents. When a copy of the crime petition was obtained, the threats became known publicly. In the petition which was signed by 3 muslims from the neighboring villages, beside many issues there was also a demand that the anti-government activities of the monastry be ended. The crime petition was based on 10 ridiculous topics. One statement in the petition caused 5000 people from the town of Södertelje in Sweden to go out for a protest meeting regardless of the cold weather on 14th of December. The statement was as follows: "Sultan Mehmet said that anyone who cut off a branch from his trees would be decapitated". Non-muslims are being threatened to be killed even if they touch a tree; almost the same thing is happening in Iraq now. That's why the residents of Södertelje wanted to say "stop" to the persecution, oppression and murders of the radical Islamic fundamentalists and gathered in the town square to support the monastry. That is O.K., but why is the monastry so important after all? Mor Gabriel: ("Mor" means saint and the monastry is named after a saint called Gabriel). I am Assyrian. We are also called Syrians and Chaldeans. The village of "Yayvantepe" is within the administrial borders of my birthplace Midyat. It is located in the district called "Turabdin" which means the servants of God. It is also in the North Bethnahrin, that is the North of Mesopotamia. Many people say this region is the birth place of civilizations and Christianity started and took its shape there. Mor Gabriel Monastry is standing in its place for about 1600 years. Its foundation goes back to 397 A.D. The language of Jesus Christ is spoken and taught there; we, Assyrians, are still using a modern version of that language, Aramean, in our daily life. However, it is now said that 3 muslims are threatening to destroy the monastry with their petition. 18th of December was both a very busy and emotional day. The delegation was watched over and protected by the Turkish Intelligence Agency. The meetings of the day were full of tension. For example, I requested the governor to read the accusations concerning the monastry aloud. When he did, I asked his opinion. First he laughed, then he got furious saying that the allegations were rubbish and full of lies. The chief official did the same. However, the Cadastre Office reached a problematic conclusion. According to them, 1 square mile of the 2.8 square mile area which belonged to the monastry were in fact a property of the state. The whole area was enclosed with a high wall. Ironically, everyone, both Assyrian Church and government knew very well that the wall had been built in order to protect the monastry residents in the first place. The attorney, on the other hand, found it almost ridiculous that Sweden had sent a whole delegation as observers to the trial. Yilmaz Kerimo, The Swedish congressman from the Democrat Party replied: "Any threat against the monastry is at the same time a threat against the democratization of Turkey. Turkey should demonstrate that the intention to better democratize the country is serious. Words should turn into action. For example, in this context to ensure the rights of the monastry would be a good gesture". Helena Storm, the chief secretary of the Swedish Embassy in Ankara, was also the representative of the EU. From the very beginning, Storm stated that Sweden had always been among the greatest supporters of Turkey on its way to the EU membership and thus very concerned about the application of human and minority rights according to the Kopenhagen criteria. Turkey did accept its obligations to protect its minor communities. She indicated that some countries had been fiercely criticizing Sweden for its support to Turkey and such threats against the Mor Gabriel monastry were creating obstacles for Turkey in the course of EU membership. Storm added that EU would be examining every step throughout the judicial procedure. It had been a very busy day. Much was said, but it was mostly in vain. Many decision were made, but they got cancelled later on. But in the end, the accusations of the villagers somehow seemed to be vanished. It was as if none of this had happened. The next day, the trial began. There were nearly 20 people in the courthouse. It lasted only 10 minutes. The only step was to specify the date of the next hearing. As we we were walking out of the courthouse, a Turkish reported asked my opinion about the apologizing campaign which was started by 200 intellectuals in Turkey concerning the genocide made against the christians during the First World War. Letting my emotions control my words, I replied to him, "This campaign is the least they could have done". It was once again emotions that dominated the conversations with the monastry representatives and village headmen. It was now 20th of December. Delegation had returned home and I was still in the headman's house. "The metropolitan should share its land. Monastry does not need all of this land and could let go some of it. We, muslims are the majority", a man which was pouring tea into the traditional glasses said. I asked if someone could reach the 3 men who had signed the petition by the phone. Although the headman called them a few times, the sign owners refused to talk to me. "So, all of you sitting here, do you know what it is written in that petition? Looking at eachother shamefully, seven men replied: "No, because we can neither read nor write"
"What about the sign owners themselves? Are they able to read or write?" In the end, it was understood that even they could not read or write. So the question was: Who actually prepared and wrote the petition? And why did 3 village headmen sign that petition? The headman firstly said he did not know who wrote it. When I insisted on asking him a few more times, he finally replied: "A lawyer working for the government". I asked what his name was. But the answer was bizarre. The lawyer suddenly became someone whom the headmen and others accidentally had met in the marketplace. They were not remembering his name or his look. The headman and others decisively said that they did not know what the complaints against the monastry included. I read aloud all of the 10 topics in the petition. For example, when they heard that the monastry was being accused of engaging in anti-government activities, they all agreed and said it was true. But they did not have any answer to what these activities might have been. It was the same with regard to other accusation topics. "The governor thinks you are a bunch of radical village fools. What do you say about it? ", I felt compelled to ask. "The governor is right, you know. We are indeed a bunch of fools. Otherwise we would not have let them abuse us that way", one of them replied. "What do you mean by "abuse"? Who did abuse you? ", I asked. Looking at the floor, they took a sip from their tea. They were implying that I should have found out the answer by myself. However, at the same time, they pointed out that the words of Sultan Mehmet were still valid stressing that they were ready, at least symbolically, to cut off the head of anyone who would spoil a muslim's land. I, Linda Asmar, our driver and assistant left the village with many questions and answers in our minds. "Although the AKP congressman asserts that Assyrians migrated willingly, the Assyrians of Midyat were firstly massacred or forced to migrate in 1915. It is also known that they had to migrate because of the racist attacks which began in 50s and 60s and the oppression during 1974-75 Cyprus affairs. Due to the September 12th coup tensions in 80s and the terror environment in 90s, Assyrians were compelled to evacuate some of their villages which were declared as forbidden zones until 2000s. Threats coming from Hizbullah were also effective in their migration. During the martial law period, nearly 50 Assyrians were assasinated and the murderers could never be caught." Throughout my life I have always heard that Turkish intellectuals have been trying to bring down the feudal system. However, it seems that the feudal system has come back again. And maybe it is stronger than ever in modern times. AKP, which is struggling to get more and more votes in the elections, has been choosing representatives from large families and/or tribes. Of course it may be said that elections are being made freely and more or less in a democratic environment. However, this is also a kind of declining. So, Turkey is once more facing the danger of becoming a country where ignorant peasants are being abused by educated leaders. Now there are two more cases left concerning the Mor Gabriel Monastry. One of them is about whether the wall built to protect the monastry residents is legal or not. The other one was presented by the monastry against the Cadastre Office who laid hands on 1 square mile of the land inside the wall. Undoubtedly, the wall is necessary for the protection of monastry residents. The Office is claiming this 1 square mile belongs to the government, saying this portion is "an unlabored wild forest terrain". This is weird, because the Monastry has been paying taxes for the land and the forest since 1937, guarding and saving it for centuries. In other words, the area is in fact not "unlabored", contary to what it is said. Or else is this a demonstration of the power of feudal landowners? On the way home, I visited another historical Monastry, namely the Deyrulzafaran. There I met a little Christian girl whose name was Mahbuba. Her eyes were like brown almonds. Her family had recently escaped from the town of Mosul in northern Iraq because of the oppression they suffered in the hands of muslims. 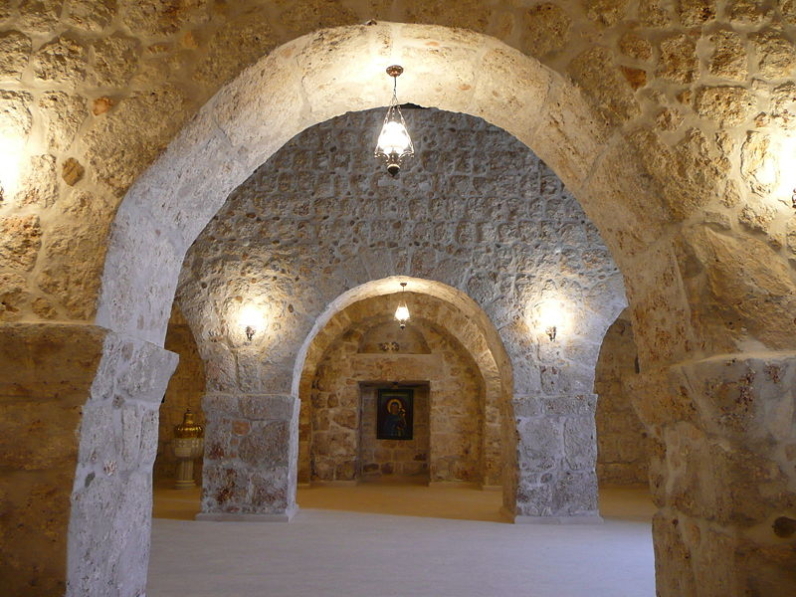 They took refuge in the monastry for a shelter. Suddenly, I recalled a conversation between me and an old villageman. It was about the Islamic oppressions against the non-muslims in Iraq. The old man said: "You can not put the blame on us for what is happening in Mosul. The muslims in Mosul are responsible for it"
But, you took part in a protest meeting in Midyat against christians, when a caricaturist in Europe drew some pictures of Mohammed, didn't you? If the police would not have intervened, things could have been much worse. You should know that you must respect our prophet! Well, then, why should the christians living in the southeast of Turkey be harassed because of what a Danish caricaturist did? The old man did not and could not find an answer to this question. He also could not answer why Assyrians, Armenians and Greeks around him in Turkey were massacred during the First World War. A childhood friend of mine who is a muslim took me to the airport by car. He was born on the same street with me in Midyat. My father and his father were friends. While listening to the radio on the way, we heard that Mehmet Kiliçlar, the governor who had talked to the delegation, was assigned to another office. My friend believed that this assignation was surely related to the monastry cases. I showed my friend photos of muslim Busra and christian Mahbuba. Two sweet, innocent kids who may be enemies in the future because of the experiences they are going through.